How often do you fill with self-doubt not sure if the colors or patterns that you putting together really work well together? It is completely normal. Normal to such a degree that it is the one thing you can almost guarantee you have in common with other quilters, this one included. Now off the bat it is good to say that the response to a pairing of colors can be completely subjective and I do not mean that in terms of someone saying “Oh, I don’t like purple” and in fact if you take the one color that you think you cannot stand but look at that color in a really broad range of hues and values, you will probably find a version of purple like eggplant or elderberry or some shade that you are okay with. Our feelings toward color are also influenced by our culture, fashion and other trends. Patterns whether polka dots, stripes, checkered, floral or otherwise can also challenge us. The best designers have a method for deciding colors and it might not be something they are fully conscious of but having a point of inspiration can help with the decision making. Now I am not a color scientist or anything like that but over time I have tried to come up with good systems to help my creativity flow and not be paralyzed with self doubt about the colors I am pairing. A quick breakdown of terms to help discuss color are the following, value of a color refers to the relative lightness or darkness of a color and hue refers to the color itself, like red, yellow, blue or aquamarine. I will not go into primary, tertiary or analogous color relationships or other terms but if you want a breakdown, you can find a good amount of explanation online to help explain these terms. Generally speaking if you are using hues all of the same value, the composition is going to feel very flat whereas when you maybe take one hue at a different value then you can create a harmonious contrast. Please add in the comments section if you have tips or rules for your color choices! Color palettes from movie stills. The mood of a scene or relationship of a character to the plot is often framed by a studied use of color to visually reinforce the message in the story. This website has an interesting breakdown of some popular movies that may inspire some color choices. 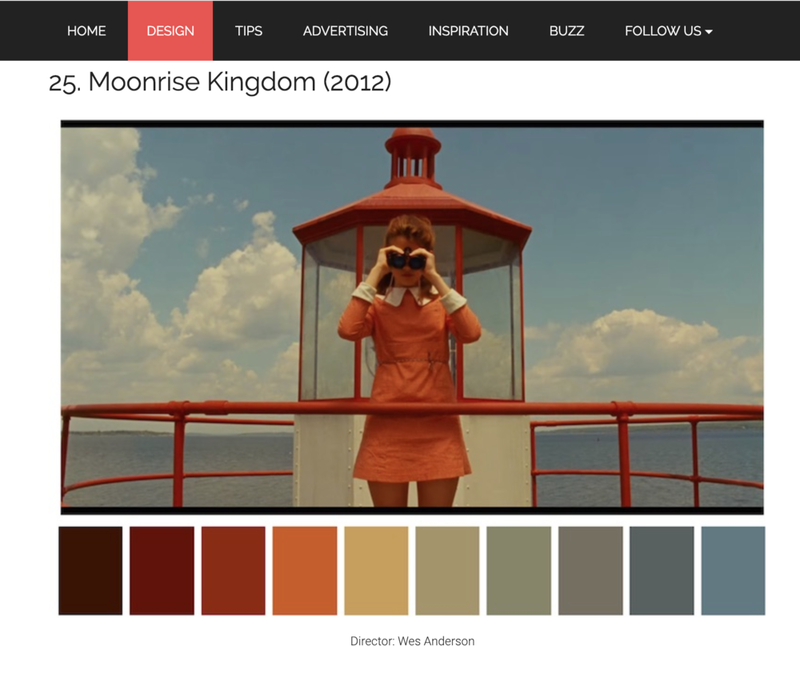 Various examples of popular films and the color palette that can be pulled from the scene. If you have an image that you really like or you can just press the space bar and the program keeps generating new color palettes. Take a screenshot and print it out or keep the photo on your phone so when you visit the fabric store you can match your fabric choices to the color palette. Pressing the space bar under the Generate tab you can see a new palette emerge. In this same program, upload an image and it generates a color palette based on the image. You can move the dot to pick new colors. Once you have your color palette and have assembled your quilt top, we would love to work with you to finish your quilt with our long arm services. Selecting the top stitch that compliments all your hard work is easy and we are always happy to talk with you. Our online order process is very If you produce more than one quilt top a month, our monthly subscription membership will save you money and headache. All our pricing includes the cost of batting, thread and return shipping of your quilt to you and you can select your desired return date! If you have ideas you want to share, enter them in the comments section below! If you have not signed up for our email list, enter it now and be part of our monthly drawing to choose one quilter who will receive a FREE LONG ARM SERVICE ! 1 year $3,564 but you are receiving $178.20 additional savings for signing up for one year!